Also Visit – डिजिटल मार्केटिंग क्या है? [Digital Marketing in Hindi] और आपके Business के लिए क्यों जरुरी है? Today the consumers have to be approached personally as their attention is fragmented across a range of channels and devices. The Internet, mobile apps, email, Twitter and so many channels have crushed the influence of TV, direct mail, and magazine ads. Only digital marketing can offer customers personally relevant, timely product and service information via preferred channels. Digital marketing also means handling data explosion. The world has a massive amount of digital data as companies are collecting and storing massive data. There is Wal-Mart with more than 1 million customer transactions in an hour. The retail giant stores that data in 2.5 petabyte databases for future use. At the core of digital marketing is data and its stature as an alternative to the benefits flowing from the collapse of traditional marketing methods. The rising number mobiles users especially smart phones and tablets have shifted marketing channel to new media where the speed of communication is the deciding factor. As per the estimates until 2017 December, India’s total advertising industry is worth US$7.94 billion in which US$1.78 Billion is going into Digital marketing including mobile ads. The future of digital marketing in India is brilliant as growth will continue at an average 16 percent as time spent by people on mobiles and social media is only increasing. As life is hectic, the mobile smart phone is the one-stop partner for music, shopping, cabs, food ordering, financial transactions and social chat and also for watching TV shows and videos. In India, the scope of digital marketing industry is bright and the boom phase will stay for many years. The positive fallout is the creation of thousands of job opportunities with job growth surpassing other industries. Today no business can think of surviving in the market without a web presence and the bright future of digital marketing for the years ahead is already assured. 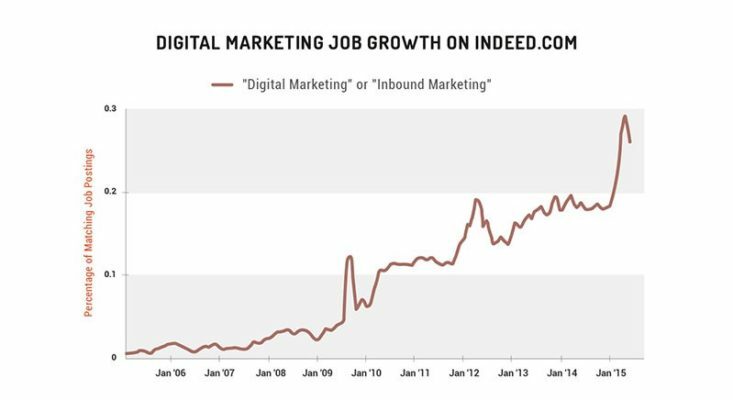 Now the challenge is the big shortage of digital marketing personnel. The online marketing sector personnel are in high demand as the industry is growing at a huge double-digit rate. The Indian government led by Prime Minister Narendra Modi government is encouraging more digital adoption and the theme of Digital India is finding applications in all sectors of human activity. We also provide top-notch video marketing services that make us the best digital marketing company in Mumbai. Contact us for ROI driven marketing in Mumbai and go digital with our expert services. Few of them include social media marketing, online advertising, search engine optimization, e-commerce solutions, mobile applications, video content, influencer marketing, website development, landing page development and online branding. 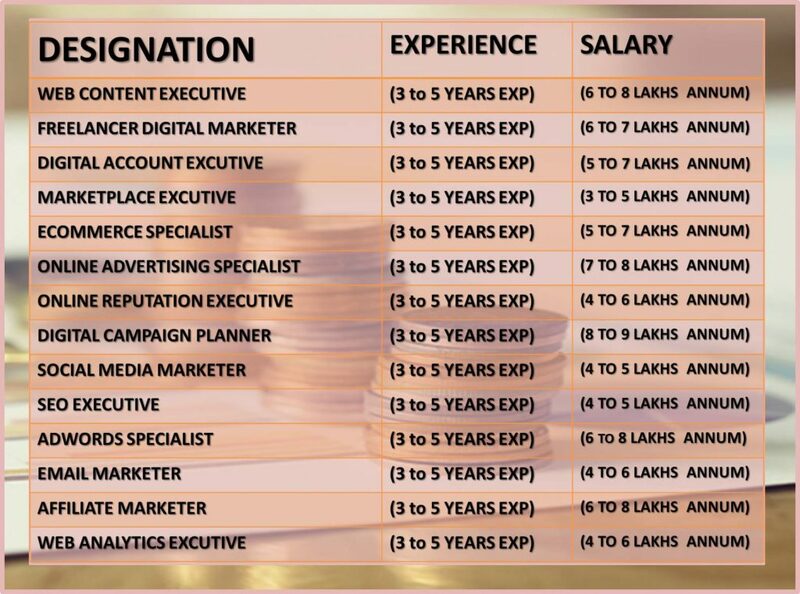 Since Digital marketing skills are in high demand job market is booming with all brands increasing their budgets for digital marketing in an unprecedented manner. The lure of big budgets, huge pay and vast career mobility are beckoning digital marketing professionals. They also have lateral benefits such as the following. 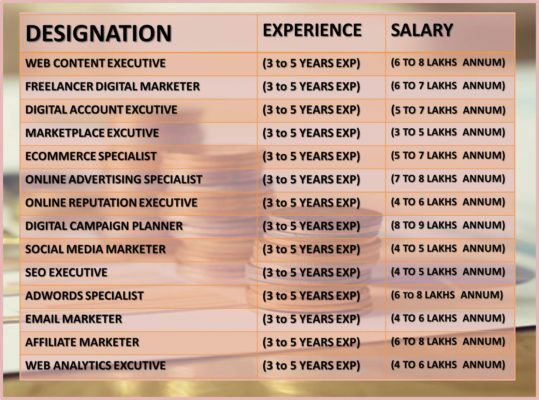 High Demand Professional: Given the high digital skills gap existing in digital marketing sector there is a unique competitive advantage to shape a lucrative career without worries of low hiring and faster firing. Digital marketing certifications and experience are recession proof. In many industries, job loss is a scare for workers when the economy is down and demand sinks. 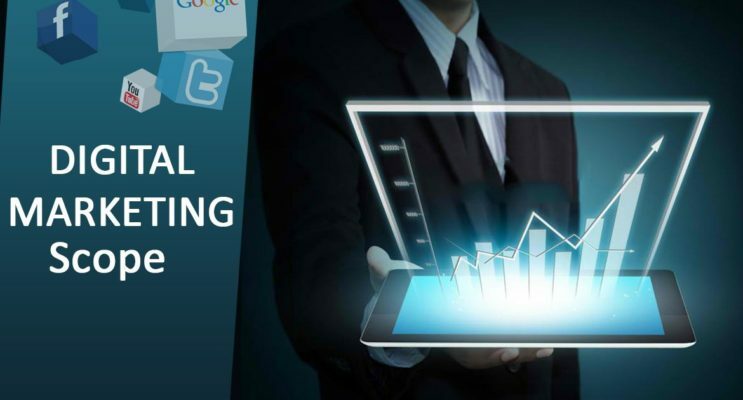 By learning digital marketing skills from the top and recognized institutes people from all sectors can make their career secure and ensure job security and career progression. The courses are flexible with varying modules. Global consultancy Mondo sees the demand for digital marketing professionals to increase 38 percent this year. It is evident that the forecast is right as hiring by multinationals, top brands and SMEs for digital marketers have increased compared to past years. 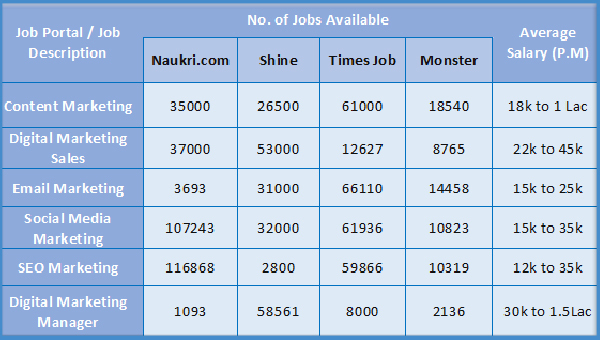 Hiring for digital marketing is high in sectors of FMCG, utilities and financial services. Get Paid more than Others: Since the demand for digital marketing professionals is outstripping supply, digital marketers have become a hot commodity. Digital marketing professionals also have the opportunity to tap international opportunities by taking Google Analytics exam and HubSpot’s Inbound Certification to better the Resume and approach top employers. There is no better field than digital marketing to initiate a career that pays high salaries. 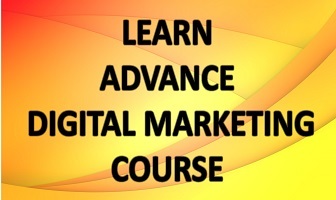 Youngsters can gain further as early movers to have a stable career by joining the digital marketing course after 12th. Expanding Influence: Virtual media is in a powerful position with its ability to sway the masses in style and consumers are being lured by social media with personalised communications in Facebook and Instagram. Digital Training Institutes: The expanding job market and high demand for digital marketing career have created a large number of digital training institutes. After traditional media started becoming unresponsive to new demands of tapping online consumers, Digital Marketing has charmed all with high engagement. Sending the trend, brands and companies are pushing ad campaigns on the internet over television ads. They see Digital Marketing investment and online ad campaign offering more returns compared to television and print ads. The high ROI from digital marketing is mind-boggling for marketers and advertisers. Digital marketing results are also measurable as social media campaigns can be measured by performance in real time without waiting for long intervals. The leads coming from digital marketing for online buying of products are trackable as an offshoot of the digital campaign’s efficiency. Web-savvy, mobile-wielding modern consumers are spending more time online than reading magazines or watching TV. The changed customer behaviors have altered the face of marketing and brought and now the talk is about the convergence of direct marketing and mass marketing. For a direct marketing professional, targeted email campaigns and mobile marketing strategies are the main tools. He will also bump into mass-marketing campaigns where online ads are edging out TV commercials and print ads. In digital marketing’s ecosystem, they are converging as consumer behavior and expectations have radically changed and lines have blurred between direct and mass marketing. That is why, irrespective of the marketing school one belongs to, to reach today’s consumers the destination is the Internet and mobile devices and social media sites are the pathways. But ultimate winner will be decided by the ability to personalize messages, readiness to offer tailored products and engage customers in interactive dialogues to build a climate of trust and loyalty. The success of digital marketing lies in the power of personalization and ability to apply marketing automation technologies by leveraging customer intelligence, optimized interactions, multiple channels and flexible response to changes in customer behaviors. To illustrate, how a digital marketer will advise a fusion of marketing methods to sell a product, let us take the case of a direct marketer of fishing gear targeting busy professionals who love fishing in spare time. The ideal online initiative is setting up an e-commerce site where shopping is possible any time of the day. The footsteps of each customer visiting the website have to be analyzed and that data must be combined with the point-of-sale transaction, data of loyalty card and demographics data to plan direct email and special pricing for each customer. This will be supplemented with a mass approach of placing the banner on domain websites like outdoor life with a blog explaining aspects of fishing, inviting customer comments on the company’s Facebook fan page to make improvements on the products. This tactical social media dialogues, public engagement with enthusiastic customers also creates effective advocates and influencers of a business or brand. This breaks the traditional marketing that only dictates to customers. Digital marketing demolishes the big wall between direct and mass marketing by addressing the needs of shifting consumer trends. Digital marketing trains personnel in the gradual convergence of direct and mass marketing models and one-to-one marketing that is customer-centred, interactive, multichannel and marketing automation. In the new marketing paradigm marketers have to generate customer insight and use technologies to improve real-time dialogues with customers. The customer insight moves in a chain. From the IT department, it goes to the marketing department and from there to the front end where customer interactions happen–websites, call centers, and other areas. The skill of a digital marketer is ultimately penning down the most appropriate strategy to push a brand’s message to the last mile consumer. There is a broad Digital Marketing scope at present as the digital media is the new media that works with the help of internet and has proved to be the fastest medium of mass communication. Today the trending buzz in market circles is the role of digital marketing and how the technology can be used in capturing new markets. surely no one can deny the fact that the future is digital. even if we see around us every business is going digital. we have an early mover advantage still now to get into the business of digital or to digitalise your business. you have very well explained the growth of digital market in near future , i totally agree with you. 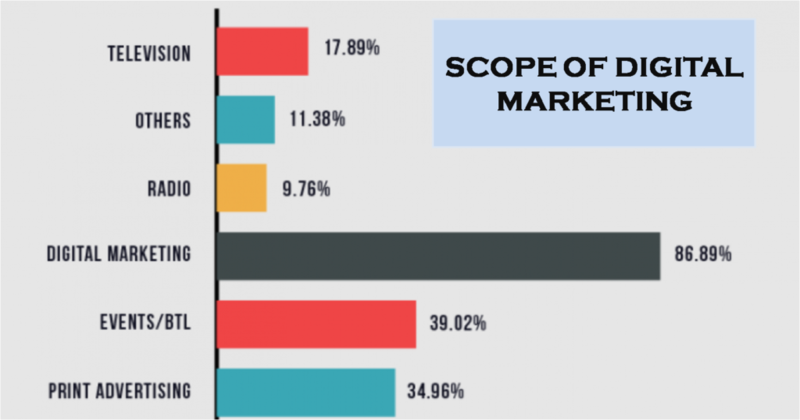 Digital marketing scope can be seen by growth in digital payments mode. Wonderful blog! Really Digital marketing has a great scope ahead and in coming years it would go on increasing only. It is the high time one should market his brand online otherwise in coming yrs they would be out of the market and their competitors might have superceeded them and have gained early mover advantage and would be earning a handsome amount of money. So it is your decision what future do you want of yours or your brand? This is very informative. keep sharing with us.